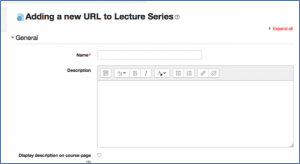 As well as uploading files to your Moodle course, you can also create new pages within Moodle. These are useful for ensuring that course content does not consist entirely of files to download. Another advantage is that you can edit the pages directly within Moodle, which is useful for information you want to update often without having to upload new Word or other files. However, you are advised to exercise caution with pages as, once deleted, they are gone. There is no ‘Recycle bin’ in Moodle. See When to use a page rather than a file on Moodle docs for more information on when to use pages instead of documents. Select Add an activity or resource, choose Page and Add. Enter a meaningful Name and add a Description if required. Select Display description on course page if you want your description to be shown below the page link. The content of the page goes into Page content. The text editor features are the same as in other Moodle contexts e.g. adding a label or topic summary. See Use the default Text editor for more information. You can type directly into the edit area or copy and paste from elsewhere. 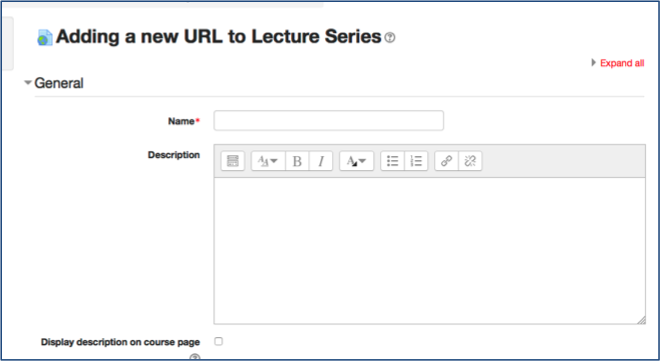 If the latter, make sure to remove the format of the original text using the Clear Formatting icon < so that the Moodle style sheet will apply when the page is displayed. On completion, click Save and return to course.